Hello traders, welcome to the price action course, and the fourth module, Market Fractals. In this lesson, I’m going to talk about pattern repetition and pattern recognition inside the cycles that we already know how to spot in the market. Now, we’re going to start by defining what we have already learned so far. We already discussed that price action is cyclical, and that these cycles can and will repeat themselves. We also know that we can measure these cycles to have an idea of future turning points in the market. Inside these cycles are patterns that will repeat over and over, and this is where our focus will be, because I mean, it’s very hard to catch the very first beginning of the move, and taking profit at the very end of the move, because sometimes, if you are looking at the daily charts, or the forward charts, we’re talking about a move that can last over a month, and it’s very difficult to hold up a decision over a month, with such volatile intraday moves. So, sometimes we are going to be in and out of these cycles, but the patterns inside these cycles are going to allow us to have trading opportunities and to trade the right side of the market. And these patterns happen because of short-term move exhaustion, profit taking, indecision in the market, and corrective moves, and this is where we are going to find the trading opportunities. Okay? Now, as traders we firstly need to assess in which cycle we are. If we are inside a bull or a bear cycle, and how long until the targets of these cycles are hit. This means that we are firstly going to look for the market direction and say, and then we are going to go to the hourly chart or the forward chart and we are going to look for these patterns and trade the right side of the market. This means that if we are in a bear cycle, we are going to only look for selling opportunities in the market. And if we are in a bull cycle, we are going to look for buying opportunities. We are not going to look for countertrend trades inside a cycle because like we’ve seen before, on the previous lessons, sometimes the moves are very, very strong. So, secondly, we are going to look for these patterns inside the cycles for trading opportunities on the right side of the market. 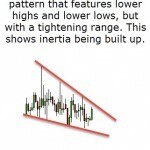 And the patterns we are going to look for are triangles, wedges, flags, and rectangles, and these patterns are going to be exactly the same over and over, and if we are, for example, approaching a calculated target on a bull cycle, for example, we can look for head and shoulder formation for a countertrend trade at the end of the cycle, but we are going to focus mainly on trading on the side of the move. So let’s go to a gold chart, we are going to watch the recent up move in gold, and we are going to talk about these patterns. All right traders, so as you can see, this is the gold four-hour chart, and we have had a very strong move, let’s say from this low to this high right here, it’s almost a 150-dollar move, from the 1160 level to the 1310. So we are going to focus on this side of the chart because even though this is an up move, you can see that it is not as strong as this one. But I mean, we could actually start from this low right here, because we are going to be looking at the same patterns over and over. So the first thing we are going to do is, we are going to assess the right side of the market, and as you can see, we are in an up move, so we are going to look for buying opportunities. And the first thing we are going to do, and let’s say that we are starting to look price action after this strong move right here. So, this is what we are looking at. Okay, so we had a very strong move to the down side, from the May 12th, from the 1250 level, to the 1130 level, okay? And this move lasted, let’s say it lasted 16 days, or 76 bars, okay? So, you can see that because we broke with this down structure right here, and when we tested it, at this low, and we moved up, and we are making higher highs, we can say that we are actually moving up, and because we broke with this structure, and we can calculate by symmetry that the most important levels are going to be around this high. Okay? Now, if we are looking at these, around… let me just thicken this out for you, okay? And let’s thicken out the bars. Now, there you go. If we are looking after this strong move, we are looking for buy opportunities, okay? And now that we know we are looking at this, we can actually start looking for the first triangle formation. And the way you look for triangle formations is, after a strong move to the up side, you might have a corrective move to the down side. And this means that price is going to start to make lower highs, okay? But then you can see that price starts to move to the up side, and starts to make higher lows, but, prices are continuing to make lower highs. So, that means that price is contracting inside a triangle formation. And because prices is trading inside a triangle formation, it means that there is a decision in the market from the bears, pushing our prices down, and the bulls, pushing price up, okay? And the thing is that when price arrives at the tip of the triangle, it starts to compress in a much narrow range, and then explode to either the up side or the down side. In this case, it exploded, or it broke to the down side, so we don’t take the trade because we are only looking for buying opportunities. Now you can see, you can actually… when it breaks to the down side, and you don’t take the trade, you can see that price re-test this descending, resistance right here, and rejects it. And you can see that we have here what seems to be a flag, okay? And this is how you play with your unbroken trend lines and your broken trend lines, maybe the higher highs that the price was making right here, were only just correcting moves to the upside inside of this flag. So you can see that price actually went, and broke to the downside, and broke the triangle to the down side, but then moved sharply to the up side, just to re-test this descending resistance that we first drew here. So what we’re going to do is we’re going to draw a line between this low and this low, and you can see that we have a bull flag. A bull flag is just… we call this a bull flag because of the shape of the formation. You have the pole right here, which is the move to the upside, and then the corrective move to the downside in a very slow fashion, which is the flag. Once the flag breaks to the upside, you can go long, and you can see that price continues with a sharp move to the up side, okay? And we are going to go to the point where the strong move to the upside started, okay, right here. First of all, we are going to draw a line across these highs, okay? And this is very choppy price action that should not be traded, and you actually needed to wait for the break of this pattern right here, or this choppy price action, before you can start trading to the upside. And let’s say you missed the first move to the upside, and the price action is at this indecisive candle at the top. You are going to wait for a retrace, and for a few candles to print, and you are going to draw the formation or the pattern that price is making at the moment. And what price is making right now seems to be another triangle, from the low of this candle to the high of this candle you can see that we have a triangle, and that we have an indecisive candle inside the triangle, and when price breaks to the upside, you can see that if you go long here with your stubs below the lows, you make a healthy profit, then price continues to this point right here, and starts breaking to the downside. You are going to do the same, you are going to draw a line following the highs of the correcting move, and the lows, of the correcting move, and you can see that again, we are in a triangle formation. And when price breaks to the upside, it breaks with the highs, well, of the highs that we previously stated were going to be a very strong level, and breaks above it. And when price hits this high right here, it starts to make what seems to be a very small bull flag, because of… or a wedge kind of formation, before it continues to the upside. And as you can see, these patterns repeat over and over, and this is why it is, well, first of all it is very hard just to hold this position from this breakout to these highs, because, well, we are kind of emotional when it comes to profit, and when we see price erase those profits, we might think of shutting out, or just closing your trade early. That’s why we need to look for these breakouts, and we need to have targets. That means that we are going to plan our trade and we are going to trade our plan, and on the next lesson I am going to teach you how to calculate those targets using just price action.